Neilson Street Kitchen Featured on Houzz! The Neilson Street Residence kitchen was featured in a Houzz article called “Kitchen Color: 15 Ravishing Red Backsplashes”. We frequently use Hakatai tile in our projects, and this Crimson Blend (one of their standard blended mosaic tiles) provides a nice, textural accent. It matches the red cord on the Caravaggio pendants, which are also lovely! The Novak Residence kitchen has been featured again on Houzz, in an article called "Brew a Café Look at Home". The indoor-outdoor feel of sidewalk cafes is pretty special, and that's exactly what we tried to recreate in this kitchen remodel. We know the owners love that space, too! 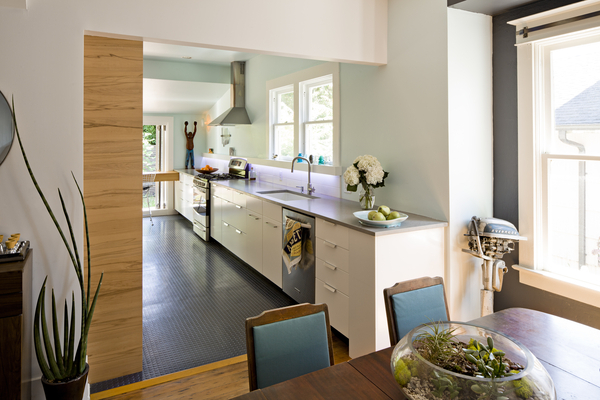 Novak kitchen is featured again on Houzz! The Novak Residence kitchen has a lot of sweet moments, but we get a lot of inquiries about the rubber flooring in particular. It's commonly used in commercial applications, but we like the look and feel in homes, too. We've done several kitchens with rubber flooring, and have even used them as a kitchen backsplash! You can read the Houzz article (which features other kitchen flooring solutions), or see before and after photos of the project. 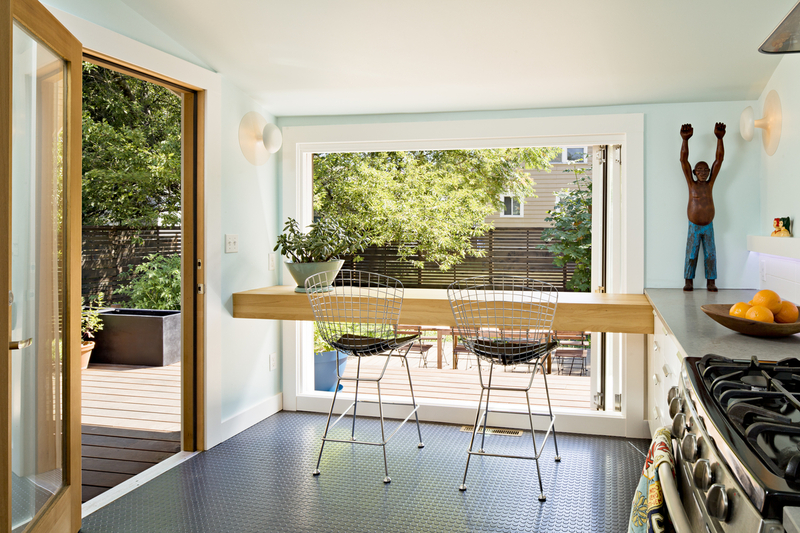 Novak Residence kitchen floor is featured on Houzz! Houzz featured our Novak Residence project on an article about various uses for rubber in a home. We have used rubber flooring in a few of our projects, and we're a big fan! It's pretty, utilitarian, and soft underfoot. Let us know if you have other uses for rubber materials in your home. The Samaras/Sorensen Residence bathroom photo was featured AGAIN on Houzz! The article is more about bathroom layout and required clearances, but we love that they chose to use this bathroom photo as an example. We want to say thanks again to the owners, Isabel and Marcos, who inspired this design; and to Joe Fletcher, who continues to help us capture the essence of our projects through his beautiful photography. 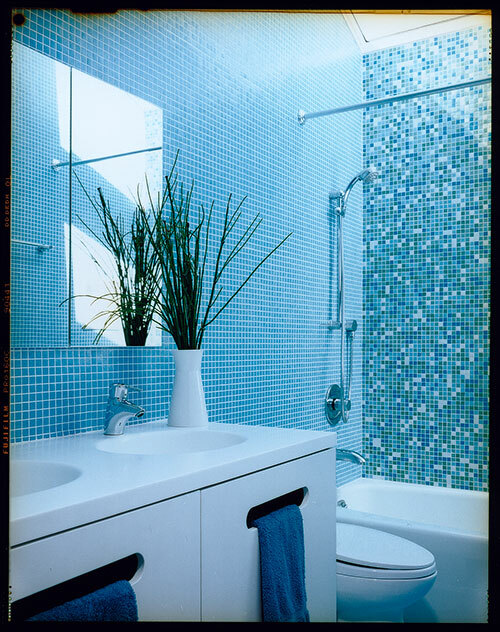 The Samaras/Sorensen Residence Bathroom (it is called the Stannage Avenue Residence on our Houzz page) has been featured on Houzz, in an article called “Bathed in Color“. This project was designed and built in 2005, so it's proof that even colors can be timeless!